A cup of herbal tea, on blustery days like this, warms me from head to toe. After I've been outside clearing a 6-inch snow from the path taking me to the chicken coop, then another path leading to the goats, coming back in the farmhouse to a warming cup of tea makes it all worthwhile. Lately I've been thinking, why buy herbal tea when I can easily grow the herbs I need myself? I'll know exactly what is in my tea and know that it's absolutely organic. To begin with, I'll keep the garden outside my kitchen door...the herbs will receive full sun and be close at hand come harvest time. Next, I'll choose as many fuss-free varieties as possible, brushing up on how to best care for each herb, and making sure I harvest them at their absolute best flavor. What will I plant? Old favorites such as chamomile, apple mint, lemon verbena, pineapple mint, lemon balm, and peppermint. And then, just to add some new flavors, I'm going to plant lavender, cinnamon basil, sage, and ginger. Now that I've chosen my plants, what's the best way to grow them? Herbs need to be in full sun, in soil that drains well. My garden will be against a wall, so I'll plant taller herbs in the back, then stagger shorter varieties toward the front. If you want to plant herbs in your yard, create a clever circular design by planting tall herbs in the middle surrounded by smaller varieties. (And herbs grow perfectly well in containers, too if space is limited.) Keep an eye on them to be sure they're getting plenty of water in the long, hot days of summer, and be ready to snip them at their peak. While you can certainly dry herbs to use year round, you can also enjoy them fresh! Snip them early in the morning, rinse under cold water, pat dry, then store them in a mason jar of cool water and use within a few hours. It's also easy to dry herbs...simply tie them into small bunches and hang them upside down to dry for several weeks. They could also be dried in a food dehydrator if you have on handy. Once they're dry, store them in an air-tight container. You can also find fill-your-own teabags for sale...fill them with your own herb blends to share with friends. Tuck several bags into a vintage teacup...a gift they'll absolutely love. Recently, at a local shop filled with all kinds of wonderful vintage finds, I spied a pretty retro teapot that was cleverly turned into a wind chime...I think it will be just right hanging in my tea garden. When the snow is gone, and the ground is warm enough for planting, I'll share the progress of my tea garden from the first plantings to harvest, and even share some of my favorite herb blends. Dreaming of warmer days...planning a garden is ideal on this blustery afternoon. Earlier in the spring, I found myself wandering through one of my favorite shops...a great small-town store that has become a "must" anytime I'm nearby. Filled to the brim with everything vintage, primitive, antique, and retro, it's nothing short of fabulous! Something about it caught my eye...the lovely shade of turquoise-blue, the talent behind the hand-lettering, the message. 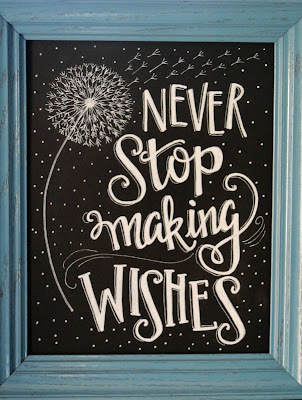 Yes...so true, NEVER stop making wishes! As much as it called to me, it really didn't "fit" into our style. Built in 1864, I've tried to fill our home with things that have a sense of history...old trunks, cupboards with wavy glass, sponge-ware dishes alongside yellow-ware bowls, spinning wheels, handmade quilts...you get the idea. As cute as this sign was, it just wouldn't work. After wandering through the store, I finally told myself, "It NEEDS a home." You see where this is going...yep, it did come home with me. I wrapped it in paper and tucked it away. Not sure what to do with it, but knowing it just had to be a little gift to me, from me. Which leads me to this...no matter what, NEVER stop making wishes. What do you wish for? Dreams delayed come true every day! Just because you're living in an apartment now, doesn't mean you won't be gathering eggs from your own happy hens in the country some day. Making business deals across the conference room table, doesn't mean that you won't be making lunches for kids, and yes, climbing the corporate ladder, can be exchanged for chasing fireflies. Here's a little story of my "dream delayed." An earlier post of mine was titled Dream A Little Dream and all about the search for a vintage camper--a search my teenage daughter began--and I was determined to help her. There's the story of the cutest little 10' Shasta compact camper that was the $100 find of the century! Not my find, of course, but one lucky gal had her wish come true. It was so...Tiny. Yellow. Adorable. Then there was another Shasta I drove by for several days just pondering over. Maybe? Maybe not. Okay, definitely! Peeked inside...no leaks, had potential, yes! Bring the Hubby to look over it/climb under it...let's make plans! Lesson learned...do not ponder too long. By the time I decided to show it to Hubby, it was gone. On it's way to Michigan with a young family. You know, for months I found myself still looking at the spot where it sat...as if I could turn back time and it would still be there. I kept looking in the paper and reading online auctions. Nothing was right, or nearby, or simply nothing existed at all. Vintage campers have taken off like wildfire and I could find nothing. And so the search continued...for years. One day I sat down to catch up on a friend's blog, I'd followed the progress on her 1963 Yellowstone camper for about 5 years. Freshly painted, with cheery fabric stitched into curtains and comfy seating, it was fun to look at the before and after snapshots. While reading her blog I blinked...what? "I have decided to let our little trailer find a new home." No pondering this time...I immediately commented, and then, just in case she didn't have time to check her blog, I sent an email. I knew that the camper was well-cared for and only about 15 minutes away. In no time Hubby and I looked it over, then brought along a friend who knows all the ins and outs of vintage campers. He suggested roof repairs and a quick fix on the water line. And you know what? That sweet little 13 foot 1963 Yellowstone Cab-over camper is sitting at our farm. The first thing I did was unwrap and hang the picture telling me to "Never Stop Making Wishes." While the turquoise blue wasn't right for our home, it was perfect for a camper now named Maizy! I'm dressing her up with turquoise, cherry red and a bit of lightning-bug yellow...I'm having fun putting my own retro spin on her. And you know, for someone who loves antiques and primitives, who knew I had a surprising amount of vintage goodies tucked away just waiting for someday? I'll share some more photos of her interior transformation...what fun it's been for my daughter and I to camp out in Maizy...even if we never left the back yard. This morning’s walk with a dear friend found us enjoying the brisk and frosty air. The weather in our part of the Midwest has changed quickly…going from warm and sunny to downright chilly. It was 17 degrees one morning last week…brrr! November has arrived, and as we walked we began talking about Thanksgiving and all that needs doing. There are plans to be made. The dinner menu: ham, turkey, or both? Do we truly need three pies…pumpkin, apple, and cherry pie? Side dishes…and old family favorite, Kingston mashed potatoes, are a must, but are they served alongside brown sugar-glazed carrots or succotash? Whew…as much as I love Thanksgiving, the mere thought of all that needs doing can send me into frenzy. And while there is the inevitable debate on jelled versus whole berry cranberry sauce, this year, I’m determined to SLOW DOWN. Like so many of you, that has been my goal all year, slowing down, keeping things as simple as possible, and keeping home as a haven and resting place from the worries outside. Alas, as many of us have found, keeping things simple is easier said than done. We all look forward to the holidays...tantalizing aromas that fill the house, a crackling fire, the post-dinner nap, board games, favorite old movies, and remembering to give thanks for the many blessings we enjoy. This year our Thanksgiving decorating has taken a turn. Yes, the pumpkins and bittersweet are still there, but also reminders of what the day is truly all about. I'm sharing some of what we've created this year...simple and done in no time. Come on! Pull out a permanent marker and grab some pumpkins at the farmers market (they’re all on sale now!) and let’s get started! Use a stencil...free-hand the lettering...just have fun! There's no right or wrong! Wishing you a blessed Thanksgiving from our family to yours.